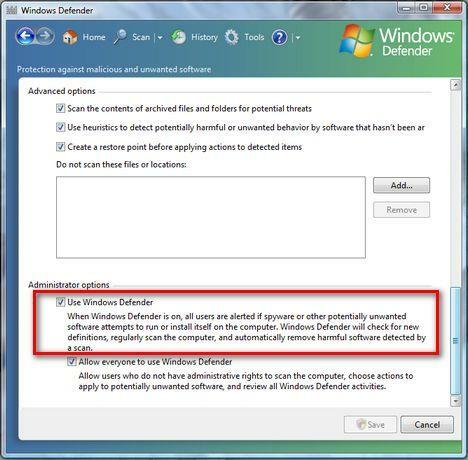 Even if Windows Defender is offered for free and it has decent protection features, some people might prefer other applications to secure their system from spyware and other threats. In this case there is no point in having two similar applications running at the same time, both of them consuming system resources. This is why disabling Windows Defender can be a good idea. Windows Defender hasn't changed much over the years. In Windows 10 you can turn it off by first opening it. Click the search icon (magnifying glass) in the bottom-left corner of the screen, type "Windows Defender" and open it. Now click the "Settings" button and there you can manage it. Here you will find a lot of configuration options. Scroll down to the end of the list. You will find there a section called Administrator options. 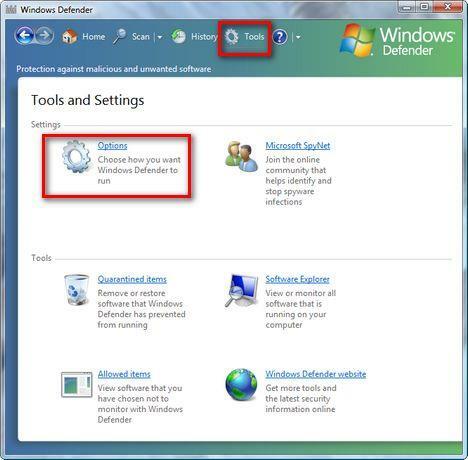 Deselect the Use Windows Defender box and press the Save button. If UAC is turned on, you will need to confirm that you want to continue with the change. 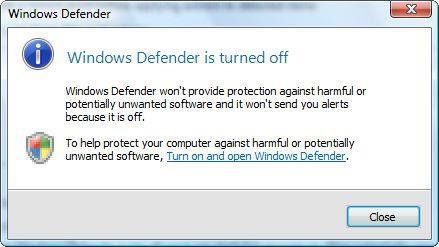 Now you will receive a notification saying that "Windows Defender is turned off". Click on Close and you are done. Actually, it IS a good idea to have more than one program of that kind installed but not running at the same time. Actually it isn't a good idea, to have them running at the same time. I use Kaspersky Anti virus, I see disable windows defender or not? So, I'm Thai people from Thailand. My English is no good, Sorry. Which version of Kaspersky are you using? My Kaspersky is 7.0.0.125 and update everyday. Kaspersky v7 offers additional real-time protection from spyware and adware so you do not need to keep Windows Defender running at the same time. You can use it to scan your system from time to time, to have a 2nd solution make a clean-up, just in case Kaspersky missed something. I have Virus Scan Enterprise and AntiSpyware Enterprise 8.5.0 and after reading your article, I am assuming I can disable W defender, is that correct? thank you. Yes, that is correct! You can disable it. On the contrary mbsamart, I think you should leave Windows Defender running, as kaspersky doesn't catch many spyware related items, especially the lower end ones like cookies and certain malware. When they said it isnt a good idea to have 2 programs, they meant 2 spyware-centric applications. Kaspersky is not one of those, so it would still be in your best interest to have some sort of antispy app running. If you have cheap, free adware, spyware programs then yes you want all the free programs you can get, but don't run them at the same time. I have spy sweeper the best program on the planet for this stuff....so I don't need windows defender running in vista or anything else so I disable them. Free stuff is not that good..but better than anything until you can afford to step up to the plate. I am Running nod 32 is it a good idea to turn off windows defender? It depends. Which NOD32 product and version are you using? Nod32 is enough against spyware. But if you disable it, it's better to use other anti-spyware programs like Spybot S&D, SpywareBlaster and spywaredoctor. All for free! i'm having the 0x800106ba error, I already searched the internet for it but never find a 100% solution for it. I think that i have to uninstall windows defender, and maybe re-installing it then. i can't even open it now. i have exactly the same problem. i keep getting the same error and can't open windows defender at all. why is this happening and what can i do about it? i too am on vista and i have microsoft security essentials. I have symantec endpoint security can i disable windows defender and firewall or only one of them or netiher. I was fixing up someone's computer two nights ago (Vista Home) and this thing was too busy blocking Peerguardian and AVG while letting malwares roam free like horses on acid. Maximum annoyance, minimum protection. Comodo Internet Security + Firewall = Complete protection. I have windows vista home premium and windows defender came on my computer when I bought it. I want to know if both of them can run on my computer or if I should turn off defender? Please help. You can leave them both turned on. However, Kaspersky provides anti-spyware protection just like Windows Defender. If you notice some slow-downs, then disable Windows Defender and leave only Kaspersky turned on. HELP! I installed McAfee and I am getting an error message at startup about Defender (cannot initialize). When I try to launch Defender to disable it, I get this error message. How can I disable if I cannot launch it? Thanks in advance. Since I installed Mcafee Security, I have been getting an error message code Ox800106a and windows defender fails to initiate. I am assuming that maybe McAfee has disabled the program on it's own. Not sure, please advise. I updated my McAfee program and starting getting the Defender error. I would like to stop the Defender program as suggested but I can't open Defender. An suggestions ? How To Manage Windows Vista Services. last nite i got prompt notification that my pc have spyware threat. after that, my pc keep prompt me with notification saying my pc need to remove the threat by using Window Antispyware 2009. (the notification will pop up every 15 sec and it really annoying). when i click the notification. one window will pop up and ask me to purchased the Window Antispyware 2009 in order to remove the threat. this pop up keep coming every thime i cancelled the notification. really troublesome. what should i do. will above guide help me to solve this. FYI my OS is Vista Basic. Thanks for your future advice. Disable Windows Defender and uninstall the current version of Picture Motion Browser you have installed. and download the latest version of Picture Motion Browser. As I understood it fixes some issues on Windows Vista and can be used on Windows Vista 64-bit. If you still have issues and Picture Motion Browser works fine with Windows Defender disabled, then keep it disabled and use other anti-spyware programs. You can find free alternatives on our site. hey guys, what do you think of turning off windows defender over AVG's own anti-spy module? I'm using AVG and it's kinda good, so would like to know what you think. I am using the AT&T Mcafee Internet Security Suite, do I need to disable the windows defender? I have McAfee VirusScan Enterprise 8.5 on my computer. For the Spyware protection I have SuperAntiSpyware and Window Defender oth turned on. Would it be a good idea to disable Window Defender. Does two or more firewalls running at the same time present a conflict with each other, and if so is it a good idea to disable Window Defender? i have the same problem like the others...i keep getting that pop-out error about windows defender..but when i tried to open windows defender to turn it off, it won't allow me to open the program..it says "a problem caused this program to stop"..is there any other way to turn it off? If you disable windows defender how can you manage applications that run at start up as you no longer have access to software explorer.Is there another way of enabling/disabling applications that run at start up. I am running Window Vista SP1 for my laptop. I am getting an error "windows defender failed to initialize........" it gives some address. I think it occured because I tried to turn off Windows defender. Now I am not able to run Windows defender. How I can repair this error? I have McAfee and since updating it I get error code 0x800106ba every time I switch on my computer. I have tried sfc /scannow which didn't help, the only other advice seems to be to disable Windows Defender as it isn't necessary with McAfee anyway. But WD will not launch at all, so how do I disable it to stop the annoying error messages every time I turn on? i use node 32 it catches everything and it uses a lot less system resources. When i start my pc error opening windows defender appears.when i click open windows defender,again the same error appears.i have mcafee antivirus too.so please help me what do i do. I used to use Windows Defender when i had McAfee and the realtime protection did actually work when McAfee was sleeping. I have noticed the Windows Defender slows my computer down, I have now diabled it and I am using an anti virus called ESET NOD32, along with that I scan my comp. with malwarebytes once a week, is this sufficient? hi, i tried this but i can't get nowhere. windows defender won't let me go to a tools then options page. anytime i click it goes to a scan and says my computer is infected and wants me to upgrade. there is a spot called configuration where it looks like i could uncheck launching windows security at startup BUT it is gray and i cannot click on any of it. i already have mcaffee virus protection and ran a full scan and have updated virus protection so i think windows is trying to get me to pay for the full upgrade version. i just want to stop the popups on the bottom right of the screen saying my computer is infected, tracking software found, etc, etc. then the vista internet security center will pop up and the scan will come on. so annoying. i tried to go to msconfig and stop this at startup but that doesn't seem to work. do you know of any other things i can try to stop this. please help! please email at kat3325@hotmail.com. I don't get the administrative options - the program says I need to be an administrator which I am but still can't switch the thing off. I have Hughes Net and I keep getting Windows Defender downloads, even though I have disabled it, turned it off, and basically tried to remove it from the system. I already have Norton 360. Because Hughes Net will only let me download a certain percentage and if that number is reached, my computer slows and sometimes stops. How do I get defenders to stop???? I am soooo angry! why does an error screen appear when i deselect the 'use windows defender' box and then clicked save changes? I have Microsoft Secutity Essentials, should i also have Windows Defender? How can I go to the tools when the application won't even open...got this message "failed to initialized..error code 0x800106ba. I have mcafee installed, but my windows defender pops up constantly and says i have no virus installation. It's very annoying. Should I disable it? thank you for explaining the step by step on how to disable Defender. For some reason, I did not see the scroll bar and could not find Adm Options. Thanks so much! I disabled it i'm using KIS 12 + Malwarebytes Anti-Malware .You should disable it too,but don't forget Kaspersky alone can't catch most of malware/spyware. everytime i update kaspersky it stop in 15% is widows D affecting it? Whenever my laptop is blowing hot air out the side and I track down the offending process it always turns out to be Windows Defender. I have another antivirus package (Sophos) and is no where near the load which windows defender is. Turning this off is the best thing I ever did.